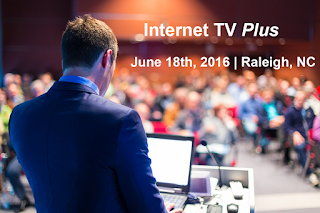 Internet TV Plus Conference - Raleigh 2016 is at the McKimmon Center in Raleigh, NC June 18, 2016. 30+ Speakers, 21 sessions, 10+ Exhibitors, Internet TV Toolbox Access, and Multiple Networking Activities. All attendees receive 1 year access to Internet TV Toolbox, breakfast, lunch, and evening networking activities with open bar, and meet the speaker dinners. Internet TV Production Book - given to all conference attendees. This guide covers how to produce, distribute, and promote TV shows, movies, and videos online. Internet TV Toolbox - This online portal provides access to sample contracts, presentations, "how-to" guides, sample project plans, templates, and other resources for the Internet TV industry. Networking Activities - Buffet lunch and evening networking party with open bar is included. Attendees can meet speakers and network with other producers, developers, promoters, and TV talent. Meet the Speaker Dinners - private dinners with speakers. Attendees register to attend private dinner with speakers at nearby local restaurants. Attendees only pay for their own dinner. Hosted By: DiscoverNet, 2474 Walnut Street, Suite 105, Cary, NC 27518 USA +1.919.301.0109.